This section includes the available product literature available for our ductile iron pipe and corresponding joint types. For more information please contact a marketing and specifications representative. The pipe rounding instructions take “out-of-round” out of your construction vocabulary. These instructions are intended and designed to fix this after cutting. With this kit you can easily change the shape of the pipe, from the outside, during joint assembly. 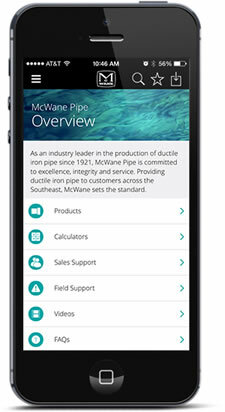 The Canada Pipe Ductile Iron Pipe Brochure is a document that is designed to help our customers reference general information about our company. This instructional kit takes "out-of-round" out of your construction vocabulary. The instructions are intended and designed to fix this after cutting. With the pipe rounding instructions you can easily change the shape of the pipe, from the outside, during joint assembly.